We’ve been around the block a few times, but still there’s much that’s new to our experience. That’s great, unless the new thing is alarming to us due to its uncertainty. If only we had the imperturbable demeanor of the Giant Sequoia. There’s not too much that these old trees haven’t encountered in their long days. A recent Bill Tweed essay about this year’s not-so-rainy season gets at this. The first-hand accounts and measurements of local weather events around here don’t go back very far, so even if we break a record that’s stood for a human life span, that’s not really all that long a time. 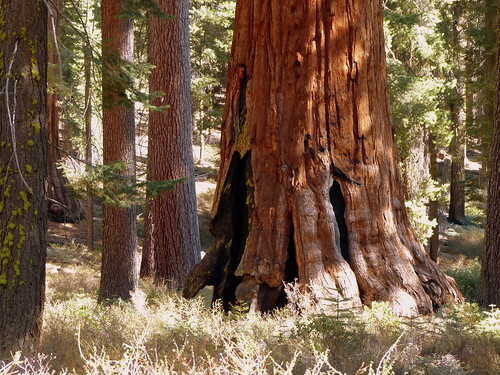 The Giant Sequoia can get to be 2500 years old, or about 30 times longer than most of us will live. So if we say, “that hasn’t happened in a hundred years!”, that’s only like 3 years to a Sequoia. And to the Bristlecone Pine, 100 years is about a year and a half. Seems like only yesterday. You can see why these old trees stay so calm. They’ve seen it all. Maybe they missed out on the last asteroid strike, but otherwise they have a lot of experience. I’m going to try to adopt this big tree attitude when the next menacing unknown comes my way.